Elemeco — Quickream: soft pleasure to taste. *Use the following video instructions to familiarize yourself with your Quickream soft serve machine and to prepare it for first-time use. Now that you've cleaned your machine, let's get it ready for service. To start, turn the cover key to release and lift the tank cover open. Use a pitcher to carefully pour in your product of choice to the max level area that lands just above the pour spout on the outside of the unit. Turn on your machine by flipping the green LED power switch on the bottom side of the machine. Press the right button on the digital control panel to activate the motor and begin rotating the augers. Next, press the button on the far left to bring the machine into "soft mode", waiting a moment for it to initialize. Press and hold the button second from the right to switch through date, time, and other useful machine settings including TLI or temperature setting. When moving the various options, click the far right button to select the desired setting, then begin clicking the button second from the right once again to lower the machine to the desired temperature. Click the far right button once again to finalize. If you don't know the right temperature for your frozen product, set the maximum temperature at -8.5 Celcius or 16.7 degrees Fahrenheit. Wait as your soft serve product cools down to temp and mixes to the ideal consistency. In about 25 minutes, your product will reach the perfect temperature and consistency, and be ready to serve! To properly maintain unused product each day and prevent unused product from reaching an undesirable temperature, begin by clicking the menu button until it reads "TLI". Then, click the button immediately to the right of the menu until you reach the "date" setting. Follow the same procedure to reach the "time" setting. Entering the date and time here is the first step to setting up night mode, during which the machine will keep your product at the ideal temperature and consistency to keep it fresh and mixed for the next day. When the date and time are set, click the button on the far right to finalize. The digital screen should read "night mode", indicating that night made has been set successfully. If you need to locate the serial number of your Quickream soft serve machine, remove the drip tray following the earlier instructions to reveal the sticker containing the serial number and other identifying information. Enhance your service by providing delicious soft serve using the compact Quickream soft serve machine. Check out the video for simple, step-by-step disassembly instructions to have your Quickream machine cleaned and ready to begin offering soft serve of the finest taste and consistency! Clean your kitchen quicker than ever with the Scotch Brite™ Dual Purpose Scour Pad 96HEX! 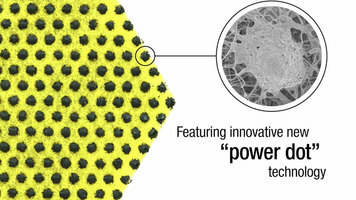 Featuring innovative "power dot" technology, this hexagonal scour pad is easy to grip and makes cleaning pots and pans easier than ever, whether tackling grease or hard, baked-on food. Check out this introductory video for more information! 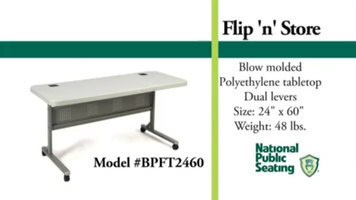 NPS's Flip 'n' Store table is perfect for classrooms, lecture halls, and conference rooms! It features dual levers for easy flip operation and front locking casters for smooth transportation. Lakeside's condiment carts can be modified to fit the specific needs of your operation, whether you need a solution for a high volume stadium or a K-12 cafeteria that serves students of all ages. Check out this video to learn more!